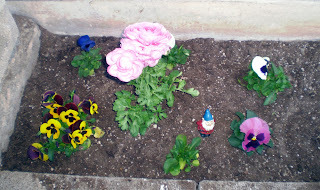 I was just out watering my flowers and thought 'I have been wanting something to post about on my blog, aside from my book, so why not share some information and photos of my little garden?' I had been looking for some sort of little hobby outside [no pun intended :P] of writing, and my husband suggested I try gardening - my only issue with it was the possibility of bees, as I tend to have a slight fear of them... but so far hanging my laundry outside has attracted more bees than my flowers have. Twin Souls is finally available!